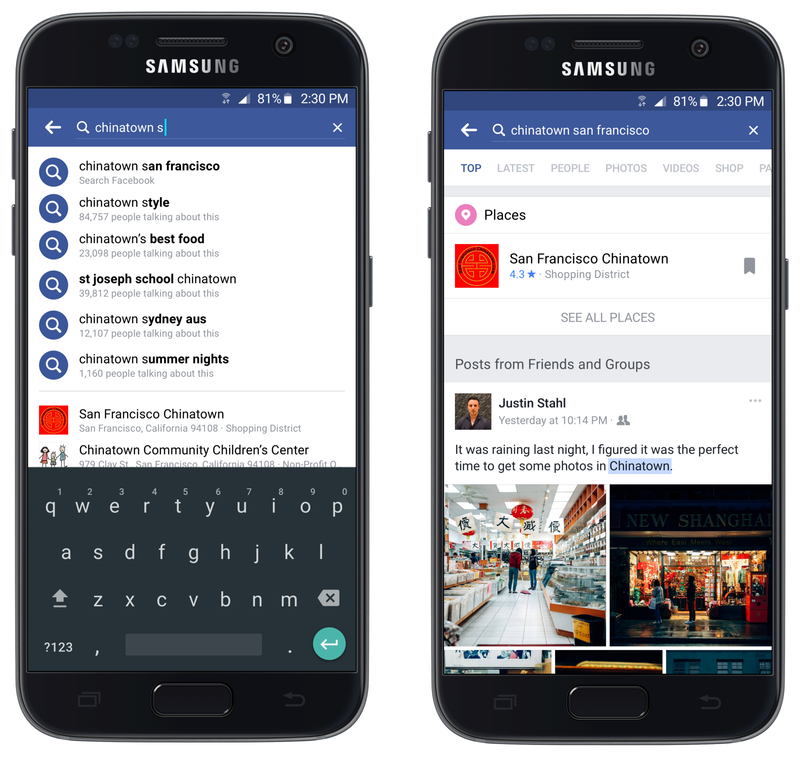 Facebook Search was originally designed to let people easily navigate to profiles, businesses, groups, and events. 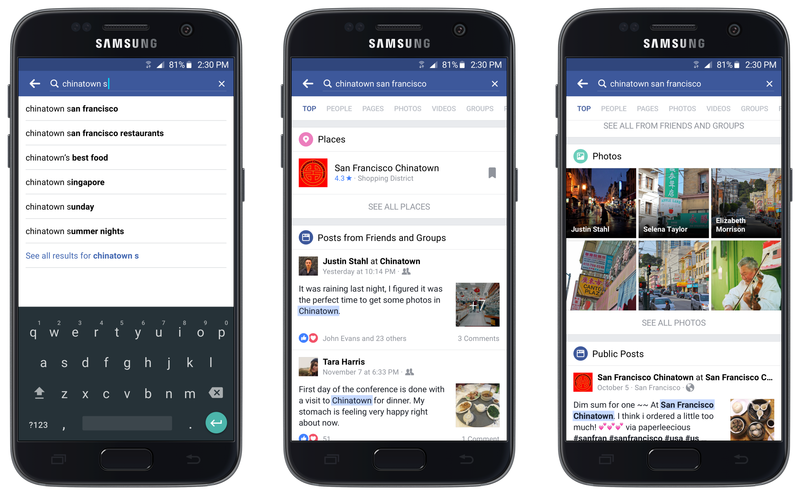 Over the past few years it has grown to include other types of Facebook content, such as the posts, photos, and videos we share in News Feed. With each new addition, the design of the system became increasingly more complex. 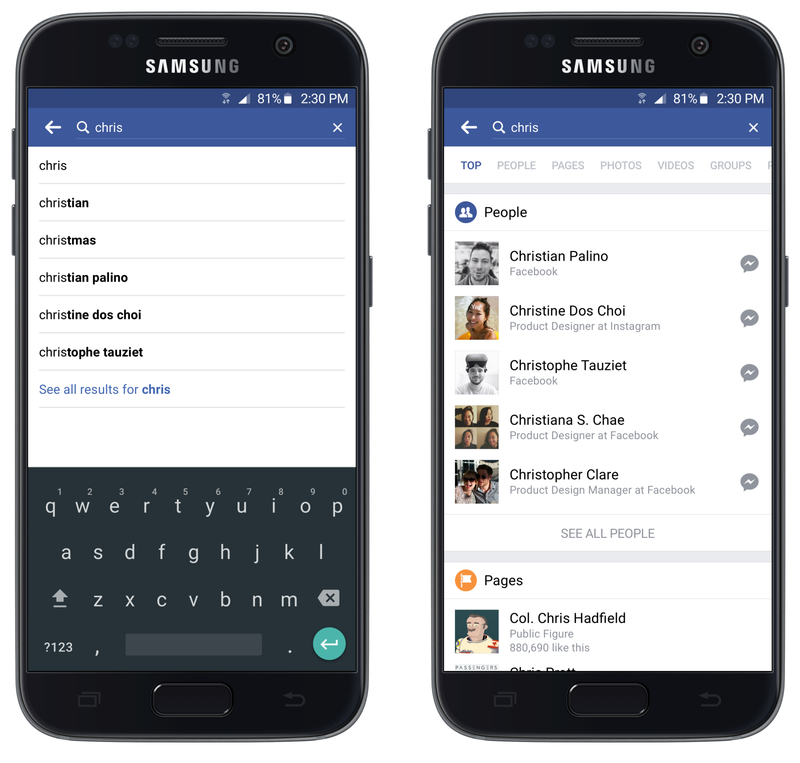 Today we’re starting to roll out a new design for Facebook Search in order to solve that complexity problem. With two billion searches a day, it was no easy undertaking. Along the way, we learned some valuable lessons about redesigning a product on such a massive scale. Typing queries into the search field with predictions to help you auto-complete. Choosing a result from a list of matches on the results page. Our Search model was a hybrid of these two interactions. The auto-complete mixed predictions that directed to results pages with navigation results that directed to profiles and Facebook Pages. The results page contained duplicate navigation results in addition to posts, photos, and videos. Predictions (with blue icons) and navigation results (people) appeared in the auto-complete (left). Similar results appeared on the results page (right). After introducing content search to the U.S., the team traveled to a few countries this year for user experience research studies to understand the challenges of bringing it to more languages. Observing the participants, we learned that they didn’t quite understand how to use our hybrid model. It didn’t match their expectations of how to search based on their experiences searching elsewhere. The feedback echoed other studies we’ve conducted, but their fresh eyes gave us a new perspective on the problem because they hadn’t used the system as it evolved. With photos, icons, and snippets of information in the auto-complete, people thought the navigation results were the only ones available. They rarely made it to the fuller results page, and if they did, they often confused it for a profile or Facebook Page. When they couldn’t find what they were looking for, they felt lost or assumed it didn’t exist. The photos and icons led people to believe the auto-complete results (left)were the only ones available. Posts and photos appearing on the results page (right) led people to believe it was a Facebook Page or profile. The team believed that a simple auto-complete containing only predictions and a compact results page would more closely match people’s existing expectations of how to search. Although it would introduce friction — another tap — for some searches, it would reduce friction — the cognitive load — for all searches, making both navigation and content search easier to understand. The new search model, with a prediction-only auto-complete (left) and a single set of results (right), more closely matches people’s expectations of how to search. In just a couple days, an engineer built a scrappy prototype that we tested in another round of user experience research. The prototype seemed to be more intuitive to people as they used it without hesitation. The simplified auto-complete helped them focus on typing and the results page showed them the full breadth of matching results, from navigation to social and relevant content. It turns out that not all taps are created equally, the reduced cognitive load made search easier to use. The simplified auto-complete (left) and the results page (center and right). With some confidence in our solution, we ran a series of tests to understand the impact of the change for more people. Using more studies, large scale surveys, and data analyses, we verified that the simplified search model unlocked the understanding that was previously hindered by complexity. Rethinking an existing system with established patterns requires a very rigorous process. These are a few of the lessons we learned through this redesign. The new design was simple in concept but complicated in execution. Rebuilding the auto-complete required months of engineering work, an investment we could have never justified on a hunch. By building a minimum viable experiment of the core idea and getting feedback from people, we had enough direction to move forward. If it didn’t have a clear advantage on a small scale, it wasn’t going to work on a large scale. Even with positive direction, we couldn’t shut everything down for six months to build a final product. Working backwards from the final model to the existing one, we broke the transformation into stages to smooth the transition, like the cover of an Animorphs book. We removed the photos, icons, and text from the auto-complete to turn the navigation results into predictions. Next, we reordered the predictions to more closely match what was being typed. Then, we made instantly-loading navigation results on the results page for the friends, Pages, and groups people visit often. Finally, we made content results more compact and easier to understand. We used each stage of the redesign as an opportunity to review, investigate, question our assumptions, and alter the course of the product if necessary. To evaluate this change we needed to paint a complete picture of people’s experiences. We learned to always tie changes in metrics to changes in behaviors and never look at numbers in isolation. We created a data scorecard that represented the advantages and risks at a large scale. Additional user experience research studies, surveys, employee feedback, and bug report monitoring allowed us to hear the voice of the people impacted by the new design. While the new design introduces slight friction for navigation, it reduces friction for most searches, a difficult trade-off to weigh. However, we believe that by rebalancing the friction and creating one consistent experience for every type of search, the new simplified model will be easier for people to use for a variety of searches. Building great products is an iterative process. 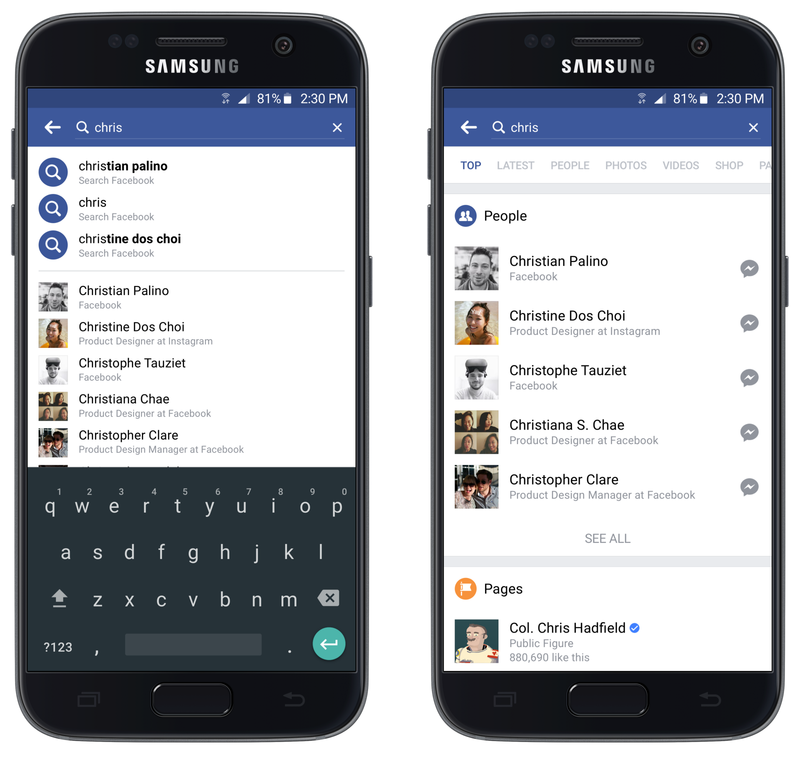 This design sets a new baseline that the team will continue to iterate on as part of our long-term efforts to make Facebook Search as useful and relevant as possible. These changes will begin rolling out to U.S. Android and iPhone users over the next few weeks. There are no changes to how search privacy works with this new design. As always, you can only see things that have been shared with you. Likewise, you control who can see your posts on Facebook and it’s easy to change the audience of your past posts any time. Special thanks goes to the entire team for their hard work: Rebecca Gray, Liz Welzbacher, Rannie Teodoro, Maykel Loomans, Ben Ashman, Daniel Francisco, Miki Rothschild, Alex Mentch, Craig Campbell, and the countless others within the Search team and Facebook who contributed to this effort. Maker of things. Product Designer at Facebook.